These instructions apply to the Deuce. The installation for the Ace is the same, with the exception of the two steps noted in red. Contact Us if you have any additional questions. 1. Put the top down and unhook the battery. 2. 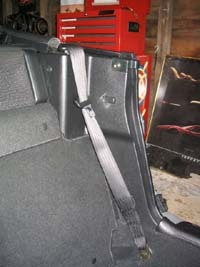 Remove the trim panels covering the seat belt towers. A. 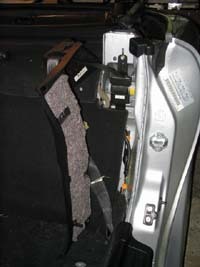 Remove The rectangular weather stripping. It pops up. It may help to "roll" it inward. B. Remove the Phillips head screw. 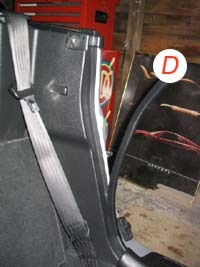 D. Remove the weather stripping that runs along the front edge of the trim panel at the rear of the door opening. It may help to lift the scuff plate to release the bottom of the stripping. 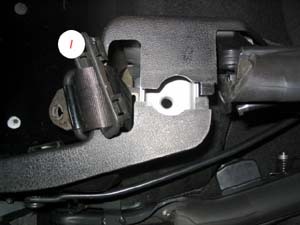 E. Remove the plastic cover from the shoulder harness guide. 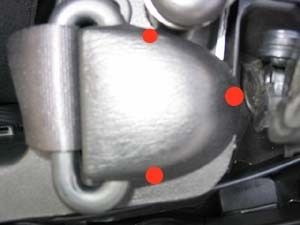 There are three internal clips. 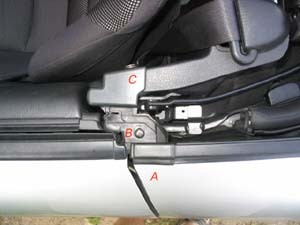 H. Remove the clip by sliding it toward the rear of the car. I. 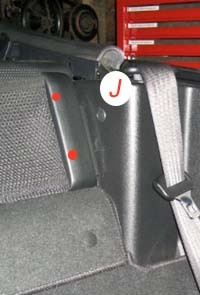 Remove the rectangular seat belt trim ring from the panel but leave it on the belt. J. If you have a windblocker, remove it. It is held on by a your boot fastener (with a Phillips head screw), and a bolt w/ a 10mm hex head. Also remove the plastic rivet. Lift the center portion and release the fastener. 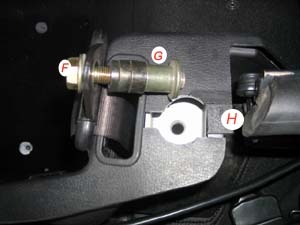 K. The trim panel can now be removed by pulling it toward the center of the car. There's a couple of snap type fasteners down low just behind the door that you will need to pop loose as the panel is pulled free.